Are you a commercial driver hauling freight in British Columbia? If so, we’ve got some great news for you. 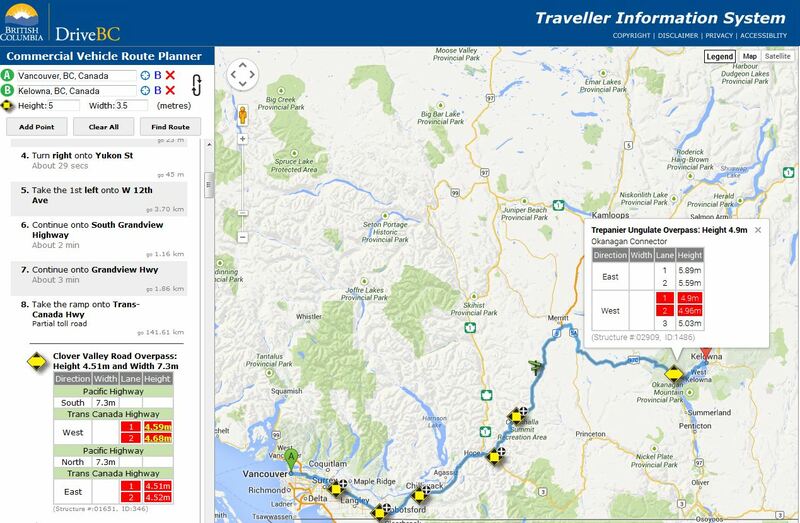 DriveBC has a new tool to make your life easier – the Commercial Vehicle Route Planner. If you’ve ever used Google Maps before, it’s the same kind of idea. You enter your starting point and your destination, and the planner shows you how to get there. So what’s the difference? Well, in addition to where you are and where you’re going, the Commercial Vehicle Route Planner allows you to provide two more pieces of crucial information: the height and width of your vehicle/load. Once you’ve done that, just click the “Find Route” button, and the route planner will show you the shortest path to your destination AND the height/width of any infrastructure that might be a problem along the way. That said, oversized and overweight loads will require additional approvals/permits, and you can always contact the Provincial Permit Centre to do that. Let’s take a look at driving between Kamloops and Prince George as an example. Say you’re carrying a load that’s four metres high and 2.5 metres wide. The planner will tell you it can’t find any problems and proceed to give you driving instructions, distance and the approximate driving time. But change your height to five metres, and suddenly you see you’re going to have a problem. The planner tells you the Copperhead Underpass heading west out of Kamloops is 4.94 metres. Farther up the road, Bello’s Underpass is 4.85 metres, and there are a few more structures to be aware of too. Looks like it might be time to look for a different route or reconsider the load. We’re continually working to make this a better, more useful tool for you, so if you have any feedback, we’d love to hear from you. Whether it about how it works, the information presented or anything you’d like to see changed, feel free to leave us a comment below and tell us what you think. Or connect with us on Facebook or Twitter and let us know there. We look forward to hearing from you. One Response to Commercial Haulers: We Have a New Tool for You – Tell Us What You Think. Great idea. If only the times shown could be for a commercial vehicle making the trip and not that of a regular car doing the trip.